I’m giving my books away this week – in hope that you will think about helping me reach my dreams and pre-order my new book. I put out the first two all on my own – now I’m working with Inkshares.com – a crowd-source publisher and their Sci-Fi / Fantasy Contest sponsored by Sword and Laser. Normally I would have to get 1000 pre-orders to get my book published – but in this contest the top 5 campaigns by the end of May all get published. For a raggedy self-publishing scamp like me, it’s the chance of a lifetime. So here we are! I’ve gone through my friends and contacts online and begged, lied, pleaded, wept, and cajoled. And, almost unbelievably, so many of them have stepped up to support me. But now I have to convince you – total stranger – to take a chance on my new book Asteroid Made of Dragons. So I want to meet you half-way — I want to give you my first two books for free. There they are – the fruits of my brain garden – please take them. You can learn more about each here and via the reviews on Amazon. The short version is: if you are a huge dork, well I pretty much wrote these books specifically for you. And now, your part of the bargain! Because we have entered into some sort of bizarre internet blood-pact – bang a gong and summon the lukewarm spirits. The link to campaign page for the third book is below. Take a look! It’s another adventure for my heroes Jonas and Rime – but fret not! I write episodic fantasy – not epic – like any good episode of X-Files or Sherlock Holmes investigation, you will be provided with the minimum required knowledge to enjoy the adventure du jour. There are a couple of sample chapters already up of the third book, but if you enjoy those FREE BOOKS I JUST GAVE YOU – the third book will not disappoint. 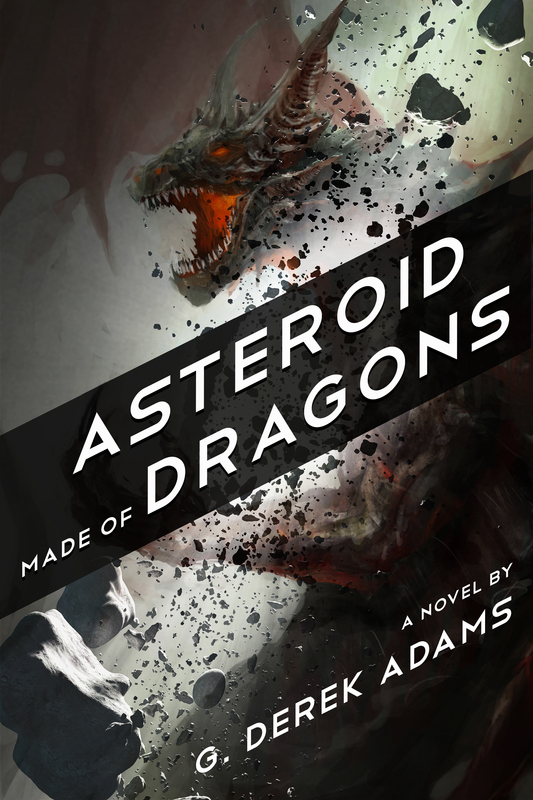 ASTEROID MADE OF DRAGONS – PRE-ORDER ONLY 8.99! Pro-Tip: If you sign up for Inkshares itself, they give you a $5 credit – which you can use towards my book! Well – I guess that’s it? I don’t know quite what else to tell you, stranger. You are on my blog now, so there’s a metric ton of my other ramblings, short stories, and other errata – plus I just GAVE YOU TWO FREAKING BOOKS. This is always where I come a little unglued at self-promotion. You have no reason to help me – but I hope you do! Even if you decide not to pre-order – maybe you know some people that would like some free books – or maybe people who would really like to help a book about a nuclear winter caused by a meteor crammed full of mythological creatures get published. There are those people, right? Leave comments here if you have questions, concerns, or burning rages — or come burn me down @gderekadams on Twitter.